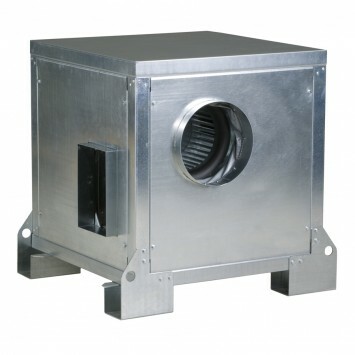 Acoustic cabinet fans certified F400-120 (CE marked). Range of single inlet direct driven low pressure forward curved centrifugal fans manufactured from galvanised sheet steel and protected against corrosion. Internally lined with 7 mm thickness of melamine acoustic foam insulation (M1). All models incorporate F400-120 rated motors approved to operate continuously (S1) and in emergency situations (S2). All motors are IP55, class H insulation. Available, depending upon the model, with three phase motors in 4 or 6 poles. 230/400V-50Hz, up to 3 kW. 400V-50Hz, for higher motor powers.